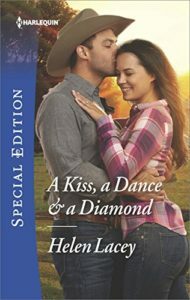 Dear Readers, I have a lovely new cover to share for my April 2018 Harlequin Special Edition book, A Kiss, a Dance & a Diamond (The Cedar River Cowboys). This is Book 6 of my The Cedar River Cowboy series. I absolutely adore this lovely cover – maybe my favorite so far (although I think I say that every time I get a new cover). Click on this ‘A Kiss, a Dance & a Diamond’ page for all links! Enter here for a chance to win signed copies! Giveaway ends April 30, 2018. To receive email notifications of my blog posts, please enter your email address here! You can change your mind at any time by clicking the unsubscribe link in the footer of any email you receive from us, or by contacting us at helenlaceyauthor@gmail.com. We will treat your information with respect. We would not sell or compromise your data in any way.